You can earn 360 yards with this purchase! 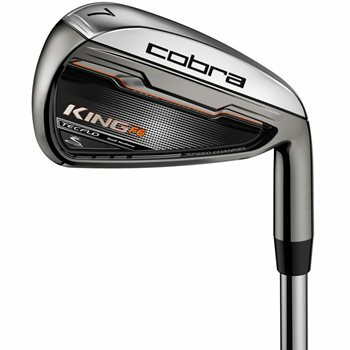 The Cobra King F6 iron set are designed with multiple advanced construction techniques to create more feel, distance, control, precision and forgiveness. They feature TecFlo Construction with a full hollow design in the 3-5 irons, a half hollow design in the 6-7 irons, a cavity back design in the 8-PW and a specialty wedge design in the AW and SW. Each design provides optimal CG location, increased ball speeds and shot control. The King F6 irons also feature Progressive Spin Technology for optimal spin and launch conditions for every club in the set. The Speed Channel sole and face creates more flex at impact to deliver greater distance through faster ball speeds. They come in a premium nickel chrome/PVD finish for enhanced durability and an appealing look at address. Are the kingf6 iron set off-set and they are not Senior clubs. are the king cobra f6 golf clubs offset and are they seniors clubs? Yes, the F6 iron set will be an offset clubhead that is designed more for a player that has a tendency to slice the ball. Also, due to the large, oversize head and construction, it is more geared to the senior golfer or someone with a slower swing speed. Hi, interested in Cobra King F6 Iron Set. Is the Matrix Ozik 65Q4 Red Tie a steel shaft? No, it is a graphite shaft.